I am almost done with the novel I've been working on. The first draft took just a few months, which I was happy about because I've discovered that it's best to write something quickly instead of agonizing over stuff that will inevitably be revised again and again. I felt like I was being disciplined and responsible by getting that first draft out. But the problem was that I felt like it was fake, that it wasn't from the heart, so I put it aside and pursued other creative stuff. Then I observed some interactions between people and found out about some other people's experiences, and ended up wondering "what if...", which I incorporated into the story. So I got rid of the first draft and totally started over. It took a lot longer to do the second draft because I was involved in exciting work that sort of subdued my desire to write. But the desire came back strong, so I started working on the book again. Now I really don't have a lot more to do--I see the end of the tunnel, which is driving me even more to finish it. I even have put off other stuff to do it, which isn't so responsible, but is still a breakthrough because this book might never get published, and that's not stopping me. I actually don't feel the despair we unpublished writers usually feel but excitement that I've written something I'm pretty happy with that is going to be completed. Hopefully I'll remember that when I get the rejections. Someone sent me a link to a hilarious menu that was weirdly translated from Chinese. There's a lot more than what I'm posting here, so check it out. It will crack you up, even if you like more raunchy humor. This is for the record: I had a day yesterday that ended up great. I had to work in two locations that were very far apart both in terms of distance and culture: the far southwest side of the city, surrounded by factories and functional stores, and the northwest suburbs, where tidy lawns and huge malls reside. Then I went to a friend's place on the north side of the city for an enjoyable dinner and wine with interesting music playing in the background, then a smooth martini lounge nearby. The conversation was great and I was able to truly relax after a very long work day. I was going to do a post here last night, but I ended up chatting very late with an online bud, and amazingly, I'm back this morning at the computer writing. So at least yesterday's activities didn't set me back. Yesterday I talked about the lack of enthusiasm I encounter when I speak Japanese to Japanese people whose English isn't great. Well, I experienced an example of that today. I was at a Japanese store, and asked a guy, in English, where the fruit was. He was speaking Japanese with a female coworker, and I haven't seen him speak English with people before, so I didn't know if his English was good. But I used it anyway. He looked at me blankly, and so did his coworker, so I asked them in Japanese. The woman said in muddy English, "You speak Japanese" with a nervous smile, and spoke no Japanese with me, but pointed in the direction of the fruit, then told me in broken English that it was elsewhere as well. If I had walked into a store in a Mexican neighborhood, they would've spoken Spanish once they discovered I could speak it. And a similar thing would happen in Chinatown, I'm sure. It wasn't as if I had asked the Japanese workers incorrectly where the fruit was, they just didn't want to continue in the language because, I think, I'm not Japanese, so broken English is better than me entering their language world. So it's both ironic and convenient that such an incidence occurred the day after I had a post about it, lest anyone think I was making such an observation up. The shakuhachi (sound samples here) is my favorite instrument--especially in modern contexts, such as in more experimental jazz or contemporary world music, which I would characterize as a blend of various instruments throughout the world playing together. I like when instruments are taken from various cultures to create new music that goes beyond their national sources, without losing traces of their own ethnicities. Tonight I saw a concert that included contemporary Western "classical" (put in quotes because since it's contemporary, it may not be "classical") chamber music and music from Persia and Asia. The latter music was incredible and dynamic, though I did like the Western music as well. But the Persian and Asian blend was very interesting and refreshing to hear in a venue that usually offers Beethoven, Schumann, Brahms, etc. After the concert, I got a chance to greet the shakuhachi player, who is Japanese and Danish. I told him I lived in Japan, and he started speaking Japanese with me--even though I didn't tell him I could speak it. I was pleasantly surprised because Japanese people rarely speak Japanese with non-Japanese (outside Japan), or if they do, they don't initiate it. Many other language groups are happy if people can speak their language, but I've noticed that Japanese people aren't. Sorry, but it seems to be true in my experience. Perhaps that guy initiated Japanese conversation because he's half European, so he's not caught up in the idiosyncracies of Japanese culture. Whatever--it was a rare opportunity that I enjoyed. What's interesting is that earlier today, I was speaking with some Chinese people about my dilemma: that I know Japanese but don't encounter many Japanese people, and if I do, they would rather speak bad English than Japanese. But when I went to China, I noticed that Chinese people were happy to hear even a few words, and even in Chicago, I can see conversational opportunities if only I spoke Mandarin (don't have much interest in Cantonese). One Chinese chick who speaks good English even said that if I were to learn Mandarin, she'd speak with me. Imagine that. **VoyCabulary, where "you can change the words on any webpage into links, so you can look them up with just a click--in a dictionary of your choice"
**Babylon, which translates words "to and from Arabic, Chinese, Dutch, English, French, German, Greek, Hebrew, Italian, Japanese, Korean, Portuguese, Russian, Spanish and Turkish"
**a Text Translator from English into Spanish, French, German, Portuguese, Italian and Norwegian or the other way around"
That's a a lot! Though I don't think Babylon is the best translation tool, but still--that place looks packed. What are they smoking in there? Just straight weed, or are they mixing it with tobacco to create a British-style spliff, or what? I wonder if their pot is spicy. But seriously: this is a word challenge as well, of course, as a cultural one. 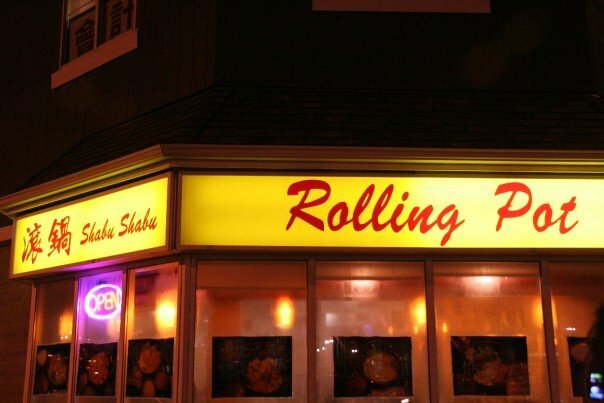 "Rolling" can be a verb, thus the humor of this sign. But "rolling" can also be an adjective, which I'm sure means something different in Chinese--bad translation! I was going to do a post here yesterday, but I totally forgot because I had to do some translations and when I finished those, I decided to work on a novel I've been revising. I can't believe I'm saying this, but I'm almost done, which means that this year, possibly even before winter ends or during the spring, I might be approaching agents for more rounds of rejections. But the difference between what I'm writing now and what I wrote before is that I really feel like the book I'm working on now is a lot better and something that more people (especially women, since the protagonist is a chick) will be able to relate to. I hope. If not, then I'm just going to move on to the next novel, which will be my third attempt. I already have an idea for one, and am ready to get going on it. Why I keep pursuing fiction writing is a mystery to me because I've had no indications that I'm going to make it. I've gotten positive feedback here and for other non-fiction writing I've done for work, but not for fiction. But I really like writing it, so I have to remember that if I fail again, at least I've enjoyed doing it. That's all we can do, really, because if we don't enjoy it then it's all a waste of time. 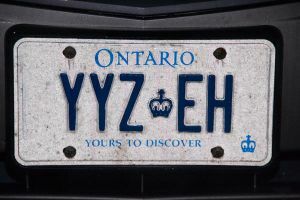 Bruce spotted this very cool license plate. It references the Toronto International Airport (YYZ), a typical Canadian word (eh), and Rush, since they have a song called YYZ. Language Hat (language blogger extraordinaire) mentioned an incredibly cool site that is an online onscreen virtual multilingual keyboard emulator that "enables you to write in your language wherever you are in the world." Albanian (Shqip) / Arabic (العربية) / Armenian (հայերեն) / Azeri (Azərbaycan) / Belarusian (Беларуская) / Bengali (বাংলা) / Bulgarian (Български) / Chinese (中文) / Croatian (hrvatski) / Czech (Česky) / Danish (dansk) / Devanagari (देवनागरी) / Divehi (ދިވެހި) / Dutch (Nederlands) / English (English) / Estonian (eesti) / Faeroese ( Føroyskt) / Farsi Persian (فارسی) / Finnish (suomi) / French (Français) / Gaelic (Gàidhlig/Gaeilge) / Georgian ( ქართული) / German (Deutsch) / Greek (Ελληνικά) / Gujarati (ગુજરાતી) / Hebrew (עברית) / Hindi (हिन्दी) / Hungarian (magyar) / Icelandic ( Íslenska) / Irish (Gaeilge) / Italian (italiano) / Japanese (日本語) / Kannada (ಕನ್ನಡ) / Kazakh (Қазақ) / Korean (한국어) / Kyrgyz (Кыргыз) / Latvian (Latviešu) / Lithuanian ( Lietuvių) / Macedonian (Македонски) / Malayalam (മലയാളം) / Maltese (Malti) / Maori (Māori) / Marathi (मराठी) / Mongolian (Монгол) / Multilingual / Norwegian (Norsk) / Polish (Polski) / Portuguese (Português) / Punjabi (ਪਜਾਬੀ/पंजाबी) / Romanian (Română) / Russian (Русский) / Serbian (Српски) / Slovak (Slovenčina) / Slovenian (Slovenščina) / Spanish (español) / Swedish (svenska) / Syriac / Tamil (தமிழ்) / Tatar (Tatarça) / Telugu (తెలుగు) / Thai (ไทย) / Turkish (Türkçe) / Ukrainian (Українська) / Urdu (اردو) / Uzbek (Ўзбек) / Vietnamese (Tiếng Việt). I talked before about how Thai people (or some, at least) laugh online: by using "5" because it is "ha" in Thai. So someone will say 555 to show laughter instead of what we do, which is "lol" (laugh out loud). Well Austin (an interesting and nice guy who I actually know offline from my Japanese class) had another nifty idea: say "mom" when wanting to laugh online, because "haha" is mother in Japanese. So, if something is funny, instead of typing "lol," he might type "mom". The only problem is that he'll have to explain the whole thought process: how it started with a conversation about the Thai use of "ha" for 5 and how that led to the Japanese use of "ha ha", which all came from the need for an alternative to "lol." I'm still not a fan of "lol"--it looks cumbersome. I wrote about how teaching is degrading in Air in the Paragraph Line. I was going to do a post here about it, but since the theme of the latest issue is work, it gave me an opportunity to vent there, and to use many more words. I pretty much quit pursuing teaching as a career in 2000 after an awful experience, but I occasionally taught a class or a private student once in a while. But 2000 was the last time I taught in a school. Well, I'm returning to teaching a class in a school on the southwest side of the city, and so far, things don't seem so bad. At least from an administration and co-worker standpoint. But I'll see next week when I step into the classroom. One co-worker is totally into languages: he's from Iran, so he speaks Farsi and also speaks English totally fluently. I first met him in a Chinese class we briefly took, where he would write the Chinese words in phonetic Farsi. I remember looking at his notebook and asking him what the script was above the Chinese ones, and he said exitedly, "Farsi--it's easier to understand the pronunciation." Very cool, indeed. He could also say hello in several languages, and had a curiosity that is rare, especially in people his age (he's closer or beyond 60). Recently, I saw him speaking with some Mexican people in Spanish, and when I asked him where he learned it, he said he learned it on the job--without any books. When I complimented him on his language abilities, he said "I love languages." Right on! I don't meet many people who enthusiastically say that. I was in Bridgeport, so I decided to stop by Chinatown because it's not far north of there. I thought I'd run into the place where I can get lots of mixed congee, but I couldn't find it--stupidly. In the past, there was construction, so I could follow the detour signs until I ended up at that store, but it's in such a weird location, I got lost. So I ended up in the middle of Chinatown and I figured that there had to be some stores there that had mixed congee. I went into some stores, and they had no idea what I was talking about. It says "congee" on the can--I thought that was odd. But I guess they only know the Chinese word[s], which is too long and tonal to remember. Store after store had none, but I finally reached one that had lots of it. I was, of course, very happy, told the owner I loved the stuff, and took four cans from the fridge. As I was about to pay for it, the owner stopped me and looked at the cans. Expired! The date was late December, but still, I didn't want to take a chance, and he wasn't about to sell bad congee. So that was it--I was so close, but couldn't acquire any, and I never did find the store I was originally looking for, even though it's really big and well-known. Or so I thought--when I asked people where it was, they either didn't understand me or didn't know its English name. Basically, I don't know where the heck I can get mixed congee. I found a Japanese place that carried it, but when I returned to buy more, it was gone. Is there a mixed congee shortage? If there is, we need to tell them (especially Taisun in Taiwan) to step up production! My husband likes to study Hebrew in its various forms, and found a Learn Hebrew site that has audio files and a flashcard-type set up for different languages, including English, French, Spanish, Russian, and Dutch. There's only audio of the Hebrew words, but the written translations of the words are in those languages. Each "card" offers the Hebrew word, transliteration, and translation into whichever language you need. Simple but nifty site.